Dubai: Retailers are heading to Sharjah at the end of the month for a 17-day mega sale that promises to offer consumers opportunities to save money during Ramadan and Eid holidays, with discounts expected to go as high as 80 per cent. The annual Ramadan Nights, an integral part of the month-long Sharjah Ramadan Festival that kicked off on May 17, is happening from May 31 through June 16, and major retailers, including Carrefour, Jumbo Electronics and Grand Stores, will be selling goods at throwaway prices. According to Sandeep Bolar, business development manager at Expo Centre Sharjah, where the mega sale is taking place, this year’s event will be bigger than the previous edition, with expected visitors rising from 130,000 in 2017 to 150,000 this year and exhibition space expanding from 15,000 square metres to 23,000 square metres. 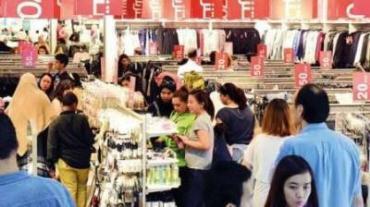 Shoppers can score some bargains on sporting and electronic goods, perfumes, clothes, shoes, home furnishings and essentials, handicrafts and accessories. Other participating outlets include AA Sons, Home Style, Al Mandoos, Nishat Linen, Nazih Group, Shoes4 US, Skechers, Smart Baby, US Polo and Avon Perfumes. Merchants in the UAE, from grocery operators to car dealers, usually offer deep discounts during Ramadan to spread cheer among consumers and keep them in the spending spirit. Some retailers are also trying to clear out old inventories. Automobile distributors had earlier announced that they’re cutting the prices of brand new cars by as much as Dh73,000 throughout the holy month. Hypermarket chains, including Carrefour, LuLu and Union Coop have ongoing Ramadan campaigns, promising grocery shoppers huge discounts on groceries. Sharjah's Ramadan Nights is not just for bargain hunters, but also for foodies and residents looking for a place where they can spend quality evenings with friends and families. There will be food stalls, food trucks and pop-up restaurants, and visitors can sample traditional Emirati delicacies alongside street food from the Philippines, China, India and other parts of the world. To keep visitors entertained, there is also a gaming arena being planned where people of all ages can enjoy fun activities and games. “From May 31 to June 16, Expo Centre Sharjah will be the region’s top retail, food and entertainment destination,” said Saif Mohamed Al Midfa, CEO of Expo Centre Sharjah. The Ramadan Nights will be open to visitors from 8pm to 2am daily during the holy month and from 5pm to 11pm during Eid holidays.